Canadian jewellery designer with a fascination for taxidermy and cites Norman Elder as a key figure in her life. Kelly McCallum is warm and open, decorated with intricate tattoos from her trips to Japan. She has been afforded the luxury of many lives before settling into a career as a jewellery designer, her work reflects the path she has taken. From pre-med student to photographer she has honed her craft; all the elements are visible in the pieces she creates. A battered fox with golden maggots coming out his ears plays on the fascination of life after death; there is a delicate humour that runs through the beauty and simplicity of her designs. Dazed Digital: How long have you been designing? DD: Do you have a muse? Kelly McCallum: Not in the traditional sense of the word. DD: What inspires you currently? DD: Were you interested in Jewellery or dead animals when growing up? Kelly McCallum: Yes from a very young age, we used to go on school trips to Norman Elder’s house. His collections had a significant affect on developing my interests in taxidermy and the natural world. I also took a BA degree in pre-med/pre-vet (the requirements are the same for both in the USA, and I hadn’t decided whether I wanted to go to med or vet school), which added another facet to my passion for animals in all their forms. I have been collecting oddities and Victorian taxidermy for quite a while now - they are intrinsic to my work. I started using vintage taxidermy pieces in my work whilst a student at the RCA. Jewellery came later. DD: When did you decide to follow the jewellery route? Kelly McCallum:I took a jewellery course while in college (my degree was in photography) and I found that once I finished my photography course, I wanted to work much more with my hands, and to feel more involved in the fabrication of objects. I went back to RISD (Rhode Island School of Design to study metalsmithing/jewellery for a year. For me making jewellery had always been about the process and about a way of working, not about making specific types of objects. Do you have a morbid imagination? Kelly McCallum: To be honest I’m not sure I guess it depends on who you ask… it doesn’t seem morbid to me, but then again my work doesn’t seem morbid to me, and it seems to be interpreted that way by others. I have always found beauty and inspiration in unusual places and natural history has always been a large part of that. I also did a degree in pre med, and the science behind the natural world has always interested me. DD: What are you working on at the moment? 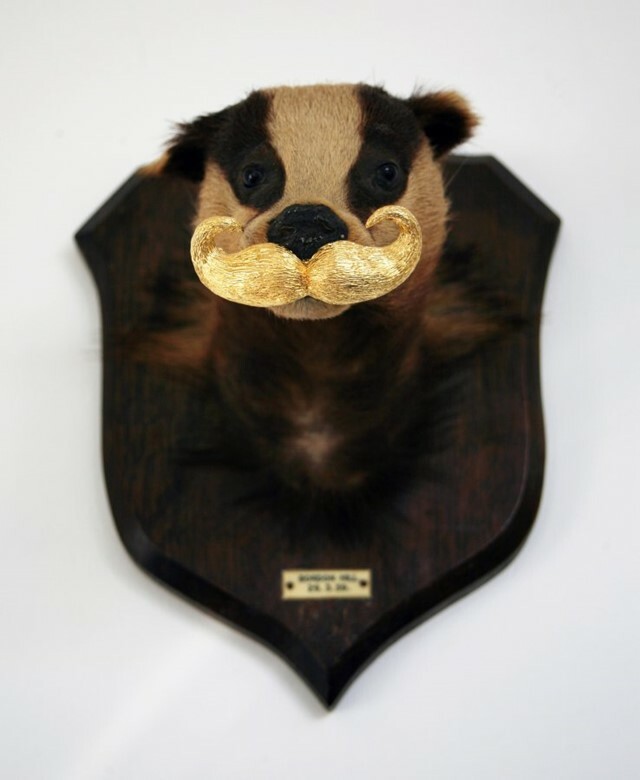 Kelly McCallum: I have just finished some pieces that include adding gold plated handlebar moustaches to various pieces of wall mounted taxidermy, as well as some brooches that also are incorporating both taxidermy and small solid gold moustaches. DD: You're an international kinda girl, has this affected your work? Kelly McCallum: Travel has definitively affected my work in the past, and I am still inspired by seeing new things and experiencing new places. However, lately a lot of my work has really been inspired by London, and by the history here, a lot of the objects I collect and use are quite classically British, if from another era, and I find that I have been more influenced by the streets around me, and in the things I see every day, than the experiences I have when traveling. DD: Which artists do you admire? Photography has also played a huge role in my life, anything from Simon Ward to Joel-Peter Witkin. I also adore the work of Sally Mann, particularly her series “Immediate Family”. DD: Anyone you would like to work with/for? DD: Where can we purchase your work?